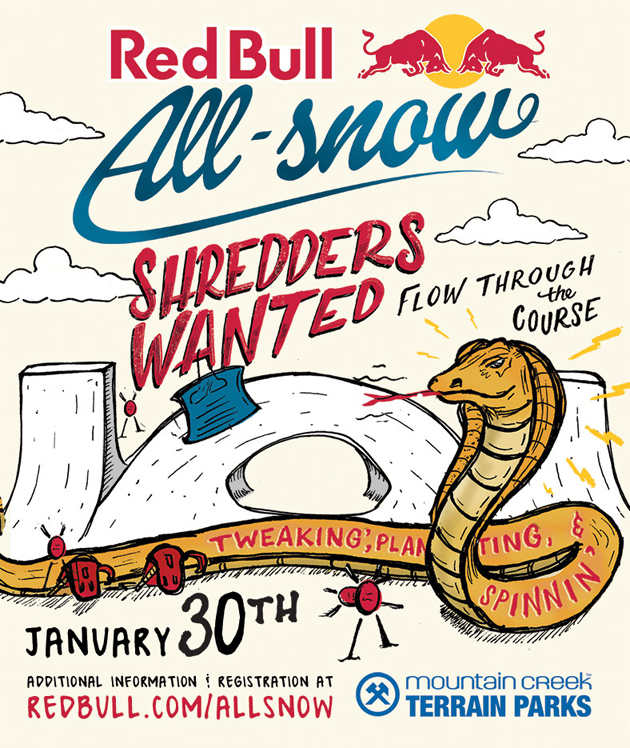 The first stop of this year’s Red Bull All Snow comes to Mountain Creek, New Jersey on January 30, 2016. Head to Creek for a skate-inspired course that emphasizes transition tricks and free-flowing carving. Before a majority of East Coast hills had expertly designed terrain parks with triple kinks, stairsets, wallrides and pole jams, snowboarders had to make due with what mother nature gave ’em. Hand dug half pipes, side cuts and natural hips were getting boosted from Jersey to Maine. Red Bull All Snow is a jam that tours the East. Each course is unique, centered around flowing lines, getting air and leaving all your jib tricks at home. Red Bull All Snow is exclusive to snowboarders this year and is a totally open jam competition. Riders will make the finals by showcasing the best tweaks, plants, airs and flow. After all is said and done, the top three shredders will be rewarded. Go to Redbull.com/allsnow for details.